To peel or not to peel, that is the question. If you seriously dislike potato peels, go ahead and remove them. But if you leave them on they will become crispy and delicious during the roasting process. Preheat the oven to gas mark 6 (400 F, 205 C). Oil a baking pan with 1 tsp. of the olive oil. 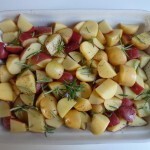 Wash the potatoes, cut them into cubes and place them in the baking pan. Cut the rosemary into pieces about 1 inch (2.5 cm) long and sprinkle over the potatoes. Grind some pepper over the potatoes. Drizzle with the remaining 2 tsp. olive oil. 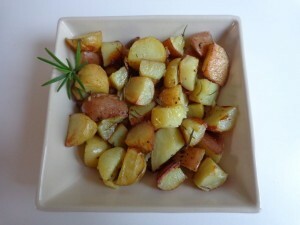 Roast for half an hour, give the potatoes a stir, and return to the oven for about another half hour, until the potatoes are golden and starting to brown. 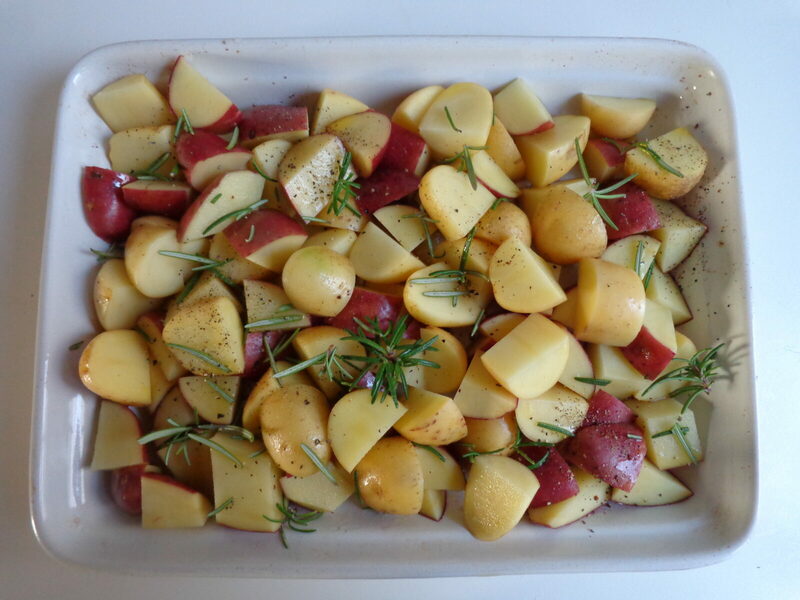 Be careful: The amount of roasting time will depend on your oven, so keep checking to make sure the potatoes do not get too well done. Remove from the oven when ready. Add the salt. Serves 4. I’m off to the store for potatoes.